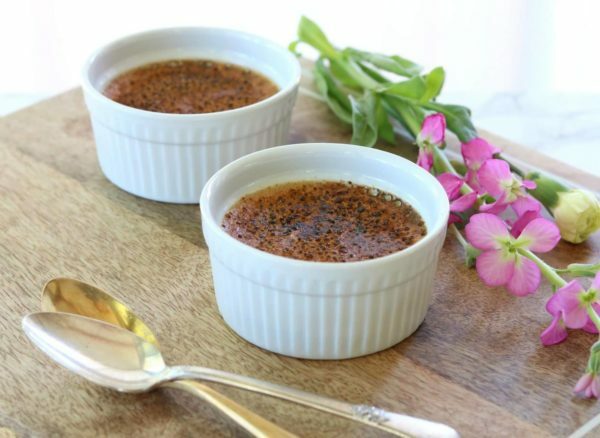 This healthified version of crème brûlée is the ideal place to start if you want to enjoy the classic dessert without a ton of added sugar or the inflammatory effects of dairy. Coconut milk is a perfect swap for whipping cream, adding the necessary fat to create a rich custard. Instead of processed sugar, coconut sugar stands in, creating a molasses, caramelized flavor. Because coconut sugar has a richer taste, far less is needed to sweeten this recipe. This easy recipe takes about 20 minutes to prep and about 55 minutes to bake. It makes about 4 servings of the healthiest crème brûlée you’ve ever had. Although this recipe does call for a kitchen torch (because adding a little fire is always fun) it’s totally possible to make this dish without one. Just place your cool—and make sure that these are totally cool—crème brûlées back into the baking dish with raised sides and add some ice water to halfway and broil them on the top shelf of your oven for about 5 minutes. Start by combining coconut milk along with vanilla bean powder in a small saucepan over medium/low heat. Be sure to use the thick paste found on the top of the can of coconut milk along with the liquid – about ½ cup of each. Once the mixture has just started to simmer, turn the heat off and allow the flavors to infuse and cool slightly for 15 minutes. In the meantime, beat together coconut sugar and egg yolks until creamy. Gradually whisk the coconut milk mixture into egg yolks in a mixing bowl, whisking constantly until incorporated. Pour the mixture into ramekins using a ½ cup measuring scoop and place in a baking dish with raised edges. Fill pan with water halfway up sides of ramekins. Bake for 35-40 minutes. The center should still be slightly jiggly. Baking time will vary slightly based on the size of ramekins used. Carefully remove from oven and allow to come to room temperature before handling. Place ramekins in refrigerator to chill 30 minutes. Sprinkle 1-2 teaspoons of coconut sugar evenly on top of each serving. Use a kitchen torch to lightly caramelize sugar. To add even more coconut flavor, top with shredded, unsweetened coconut flakes. Yum! Let us know how they turned out in the comments below! Recipes from the Annmarie Skin Care Cookie Party!